The first tornado of the day is ongoing across portions of southwest Oklahoma. 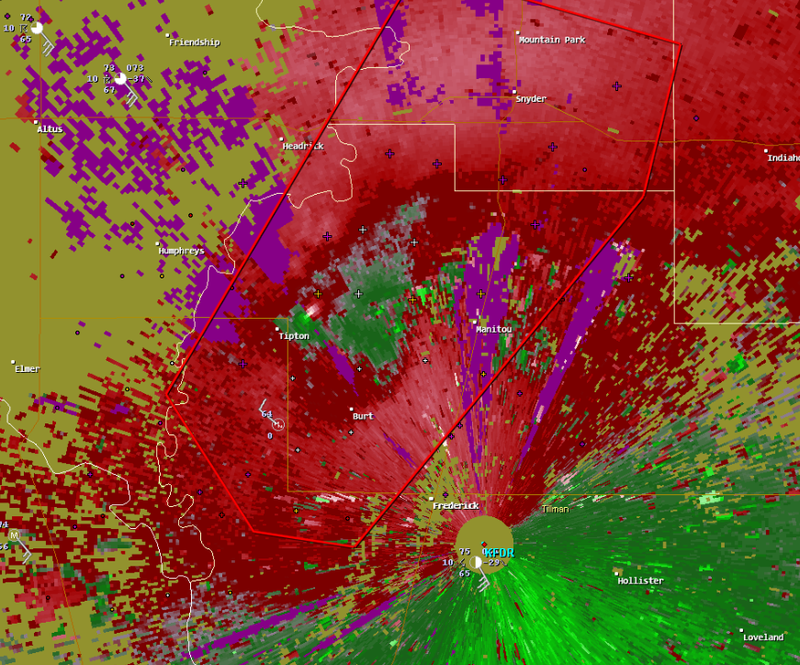 The tornado vortex signature (TVS) is located just to the northeast of Tipton, where the brighter reds and greens are side-by-side. Additionally, I should point out that the Oklahoma Mesonet has lost communication with the Tipton Mesonet station. With visual confirmation of a tornado in the vicinity, this would seem to suggest the tornado moved very close to, if not hitting, the Tipton Mesonet station. This would not be the first tornado to hit an Oklahoma Mesonet station this year. Back on 24 May 2011, the El Reno, OK EF-5 tornado moved close enough to the El Reno Mesonet station that debris wrapped around the Mesonet’s observing site. The strongest measured wind gust in Oklahoma history was recorded by the El Reno Mesonet station during the tornado’s passage.